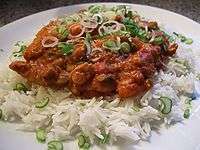 Chilli chicken is a popular Indo-Chinese dish of chicken. In India, this may include a variety of dry chicken preparations. Though mainly boneless chicken is used in this dish, some people also recommend to use boned chicken too. ↑ "Chilli Chicken". Khana Khazana. Retrieved 17 April 2012.